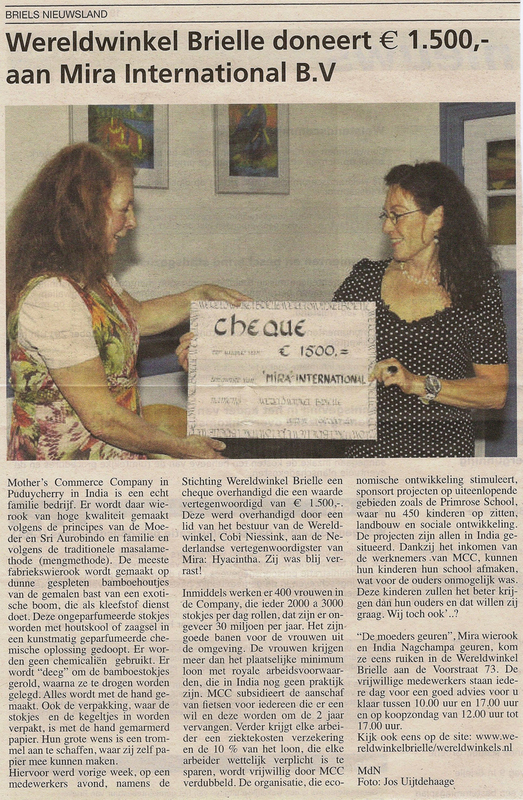 Foundation Third World Store Brielle donates € 1,500.=! Beneath you'll find an article from the local Briellian newspaper "Brielsnieuwsland" about the donation en the projects in India (they donated via Mira International). 28.2.2005. A little ahead on the actions of last week we have paid the first 3,900,= Euro for the repair of a fishing boat, new fishing nets, a new outboard engine and a new child day care. - You can obtain free incense packages and incense holders and sell these, the amount of the sales we will send to the fishing villages (through Aruna and Raghavan). You understand that these amounts will go directly and completely to the fishing villages, there will be no money lost on organization and the like. 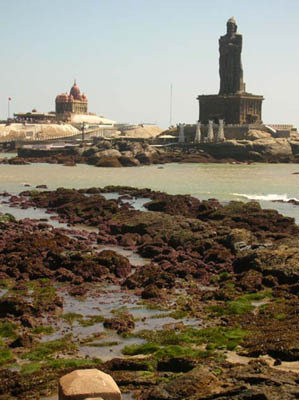 Nagapattinam is situated 84 kilometres south of Tanjore in Tamil Nadu, India ; about 325 kms south of Chennai. 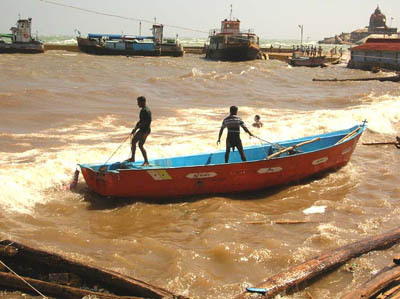 We have been visiting several of the affected areas in the Nagapattinam, Vedaranyam coastal districts. We did not go to too many spots but restricted to a few and spoke to people in detail only at two of the villages. 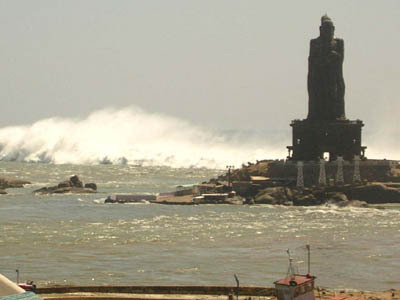 One was Kallar village about 8 kilometres (kms) from the town of Nagapattinam and the other was Vela_pallam about 33 kms from Nagapattinam. The sights were devastating. 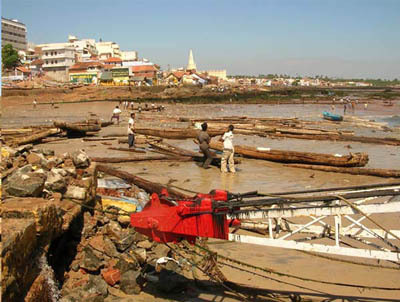 Houses scattered, filled with sand; thatched houses swept away; bodies recovered from so many spots that people just started burying them where they found them. 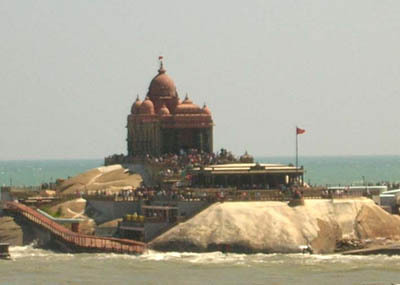 The major portion of the damage seems to be within a distance of 0.5 kms from the sea although in some places the water has travelled for about 1 km. The first row of houses invariably belonged to the fishing community so they appear to be the ones most affected. We spent time speaking to some of them fisher folk. Ø It was like the sound of a motor boat coming in. I came out to see and I was swept off and so was my house; I am not sure how I am alive today but there is not even an impression of my house. Ø I was standing on the beach with my wife and two children when a wall of water moved towards us at high speed. We ran but it was soon clear that we cannot escape it and that is when I lost my head and ran very fast and the children and my wife were lost. I do not know whether they are alive yet. Ø When the waves receded I was still stranded in the sand and I could see that my brother’s house had completely vanished with his whole family which was inside it at the time when the water hit us. The only thing I am thankful about is that the children were not orphaned. Ø The first wall of water 5 meters high rushed in and we rushed into our building. The water filled the ground floor fully and a few moments later rushed out at the same speed with which it came in. Our children were playing out in the sand on the Sunday morning and we rushed around looking for them when another wall of water came in. The water came in three times like this and each time it took away more of us. We are alive but we have lost so much of our family. Ø We have buried more than 180 bodies all over the village. We are now afraid to live here. We want to be at least one km away from the sea to feel able to live again. Ø This is like a rebirth for us. If we have been spared, it is like a fresh lease of life. Ø We were by no means poor; we were in fact quite happy, the sea has given us so much; but she took it all back in a few minutes – things which she had given us over generations. Ø We have lived for generations with the sea. We have never known such a calamity and we are now afraid of the same sea where we have, without a care, lolled for hours on end. Ø They have completely lost all their assets which they have always kept in their houses be it money, jewels, clothes. Little if anything at all was recovered. 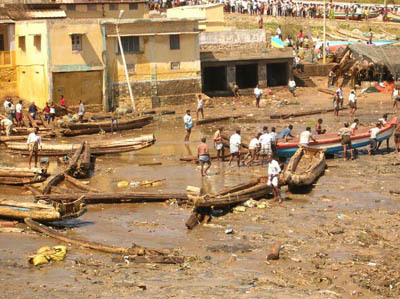 Ø Their boats which were moored in their neighbourhood have been dashed; the motors completely submerged in water and sand; their nets torn away. Ø They are a fiercely independent people. The moment they are married they set up a separate house and each house fends for itself. Sharing of resources except under specific panchayat requisitioning is foreign to them. 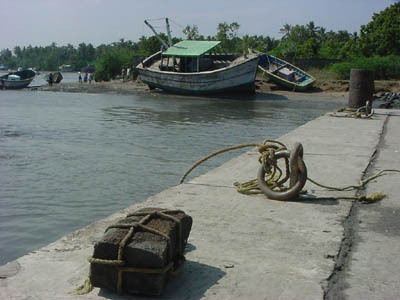 Ø A boat easily costs two hundred and fifty thousand rupees (that translates to 4200 Euro). If they have to start working for their living they need that boat. They have never felt the need to know other vocations and most are illiterate. Ø They are afraid to set up houses where they lived before and would like to be rehabilitated at least one km away from there. (They can see houses one km away being quite intact). 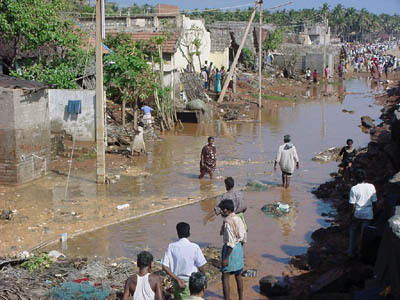 Ø A flood of people have rushed to Tiruvarur, the town about 24 kms from Nagapattinam. Ø There were and still are some fears of epidemic, but this seems to be largely theoretical at the moment; there are no signs of any such situation yet. 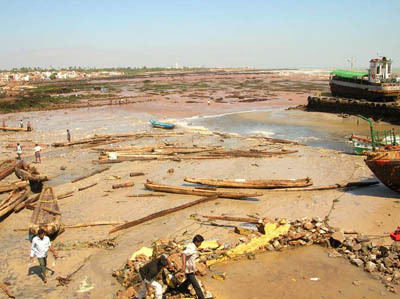 Ø Several local NGOs and the local people rushed to assist in all the ways they could. Food, clothes, utensils, medicines, visiting doctors…. 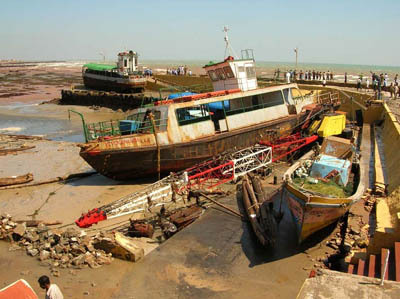 Ø Quite a few organisations, Seva Bharati to name one, began rescue and body clearance operations. Ø Several organisations began registration process and supplying based on such lists. 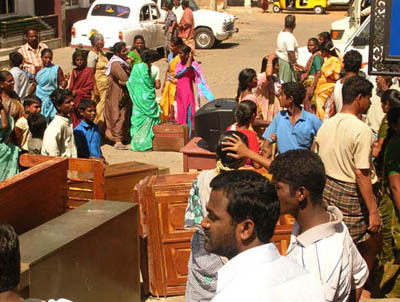 Ø Government machinery stepped in with some supplies, teams for data collation. Their presence was not felt in the relief operations. Ø On day 6, the ineffectiveness of government machinery was so condemned that they felt obliged to restrain NGOs and others from working by forcing them to route everything through government channels. This was done in the name of duplication by organisations in supplies and chaos during such distribution. 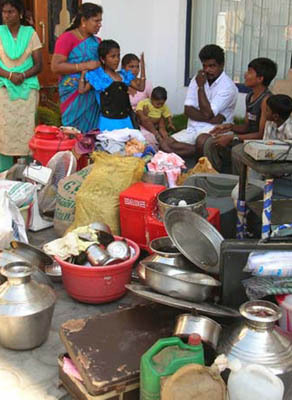 Ø Food supplies are more than adequate with various camps. But due to government regulations things have slowed down in terms of actual availability in time. Ø The government has promised about Rs.5000/-, but the people are sceptical as to when and how much will reach them. Of this Rs.2000/- has been identified as being towards shelter. Ø Some international organisations have announced their willingness to adopt certain villages. 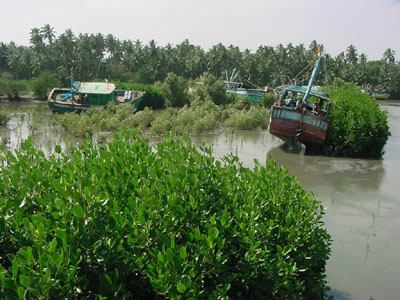 Ø There is a need to restore their livelihood capacities. Ø There is a need for housing as their houses have been completely destroyed and they would soon have to move away from the camps they have been temporarily slated in. These may be required in two stages – temporary huts and the like and then a more permanent housing solution. Ø There is a need for restoring school buildings and school utilities. Ø The children would need to go back to school and freshly supplied with uniform, text-books and notebooks. 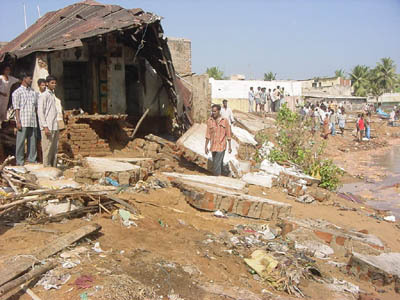 Ø Health care centres have been affected and these require restoration. Ø It may be possible to look at the option of some repayment – if given as non-interest bearing loan. Ø Please indicate how you view this (specific remarks welcome) and what part you would like to be involved in / contribute towards. Ø We would be happy to be involved in anchoring such program(s) from our end and see it to its logical conclusion. We would like to be involved in the programmes in the two villages where we have been spending time and talking to people. We’ve worked in a small way – speaking to them, listening to their tales of woe with a sympathetic ear, offering simple solutions as was immediately within our means include food/milk/provision, medicines, installing some water tanks, hurricane lamps (it is going take some time before electricity can be reinstated) at their specific request. We are not sure on what resources we can mobilise and hence what line of action would be possible by us. It is only when we receive specific responses that we would be able to compile the availability of resources and therefore the possible areas of spending and action. Providing motors for their fiber boats. Rs. 60,000/- being cost of at least 3 to 4 nets that they immediately require. We therefore thought it was within a logical possibility that we could find Rs.1,000,000/- in this regard. As the suggestion was vetoed outright we asked them to make a counter offer. Their offer was made after half a hour of loud discussions amongst themselves. They have from various sources received a few utensils. But mostly it has been what people have given without enough look-see into what they use on a day to day basis. So we went into great details with the women folk and here is a list of things that they say they need, along with tentative costs for the same. There is some confusion about the actual number of families as we have three different statistics from three sources; we are however, making all efforts to zoom in with better accuracy. But, it is sufficient for generalisation purposes that the village has just less than 400 families. We found that the above in aluminum weigh 2.5 to 3.156 kgs depending upon the thickness of the vessels. They are quoting about Rs.130/- per kg. An approximation therefore would be 400 * 3 *130 --- say 160,000 (Euro 2700,=). We have not obtained estimates for these yet, not being sure of what funds we can garner. But we would like to cover this area. We began going to the affected areas with children being our primary concern. That we got carried away can only be blamed on a ‘tsunami effect’. We were overwhelmed by the horrifying spectacle of destruction and hence felt that we need to do much more than only worry about child welfare. We have not worked out the details yet but we imagine the building may be about Rs.80000/- ( Euro 1350,=) and the items in it to begin with would be worth Rs.50,000/- ( Euro 850,=). The village had its own football, volley ball and kabaddi team. A few had their blazers on at the time of the tsunami strike and hence we happened to see them. It was indeed an eye-opener to the social structure of the village. They were progressive enough to have t-shirts with their team emblazoned. We just bought them a foot-ball and I was temporarily their hero. The team stood in a line and thanked us profusely. They had salvaged one ball but it was an old one! We would love some allocation towards these kind of things. We hope this is a detailed request and you would be able to respond more specifically as I need to know before I make commitments as such. This letter is as much a note to understand the fisher folk life style and their way of thinking, as an appeal. Please feel free to ask new questions if any. Please send your contributions to us by Cheque favouring "Anugriha Charitable Trust". 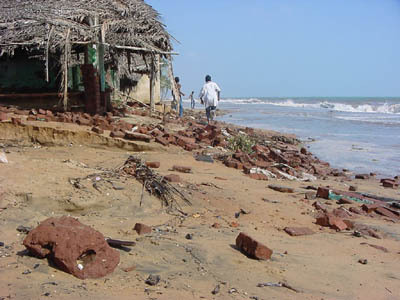 Photos of the destruction along Pondicherry and Nagapatinam coastal areas on December 26, 2004. 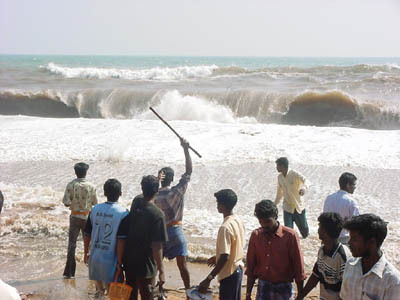 Coastal area of Pondicherry December 26, 2004. 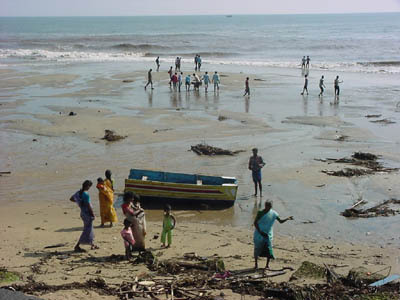 Coastal area of Nagapatinam December 26, 2004. Sharleen Goossen, Krommenie, 9 years has collected € 536,65 by selling home-made "stars of hope" to customers of her parent's store, other shop-owners, neighbors, friends and acquaintances. She donates all to the tsunami project in India.